I can’t remember the last time I posted a page that was actually a single page tall. It just worked out that I didn’t need so much space so I decided not to stress it. Plus this is a pretty funny moment. I didn’t have time today to write a bunch of new story, but I’ll write a bit more until I have to post the comic. Behold, the power of awesome that is only known as…CAROL!!! A statement that applies both to the comic and to the story. Lol. Yup. She totally did. Just for kicks and giggles. 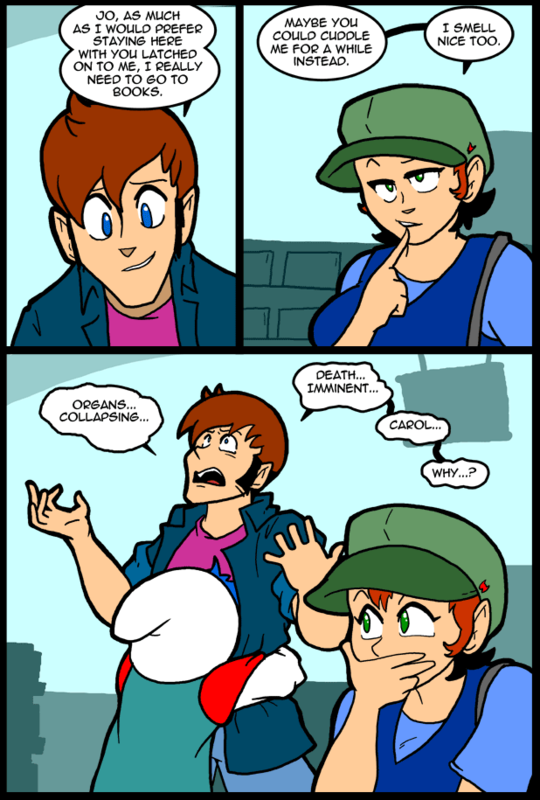 There’s actually a part 2 to that QC comic, but I don’t know if Jeph got it or not. I made it real fast when he accidentally posted the other one early. can’t wait! gonilf bfd awesomhotsauce! Can you post it here if QC doesn’t use it? I did. It’s in the blog. I have to start reading your comic earlier in the day. My oxygen depriving laughter almost woke up my roommate. :P I think Carol was not expecting so much response but defiantly a poke ment to get a reaction. Funny as hell. Oh no, he’s lapsed into Shatner! Somebody… get… the doctor! Damnit Asimov, Crave is an artist not a doctor! I would like to respectfully request a desktop of panel 2. So good. Also, Dude! Your story rocks and I’m looking forward to reading as much of it as you are willing to write and post here. I normally don’t get into reading text stories online as I much prefer a book if I’m going to read something without pictures, but this has totally captivated me. Out of the 20 some daily comics I still currently read (of dozens that came before them) this remains my favorite this past year since I discovered it, and now a connundrum. I don’t know if I look forward more to the comic (hoping for more Nina as we go), or to the new story you’ve been writing. Starring lots of Nina. For a moment or two, I wondered why there was a giant smurf attached to Thomas’s torso. Then I remembered Brooksie was wearing a hoodie…. Still, giant freakin’ smurf hug. 2nd on the smurf comment. Carol is evil. That is why I need to find my own 3d Carrol. 2d again. To the second part, mainly. “We should just put our HAD on her hip…” had -> haNd. When you’re done writing this text story in the blurbs, Crave, publish it. I will buy it, and I will make all my friends buy it, because it is awesome. I do actually know of a guy who had a burst appendix or some such similar malady after a particularly enthusiastic hug from an employee. Female, and not very big. She would blush when he would refer to her as “The Constrictor” after that. The problem was probably imminent, and she probably did him a favor in the long run. Thus proving the EVIL of Gingers.